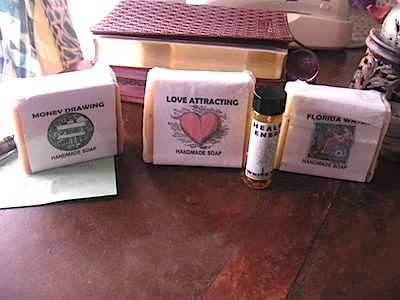 hese are good old-fashioned castile soaps which lather up nicely and feel creamy on the skin. They come in hand-cut squares which are corrugated on one side. FLORIDA WATER is more spicy and less bergamot/citrusy than Murray and Lanman’s Florida Water. It is nevertheless a delicious fragrance. LOVE ATTRACTING is mild, fruity and floral, with a faint scent of rose in the mix. It’s less spicy than I was expecting, (since I started with the Healing Nature Oil and the Florida Water soap) . MONEY DRAWING smells faintly cool and earthy. he only drawback to these soaps is that, if you have several different bars in use at once, it’s hard to tell them apart. I think they need stamps or molds or even a little dye to distinguish them. Still, these are soaps I would gladly recommend to clients. Update: Since I began using the Love Attraction soap, our already strong marriage has regained its old sparkle and shine. The grumpiness caused by the aches and pains of old age recedes into the background, making more room for the bad puns, in-jokes, and unsolicited favors that have always meant love in our house. Hello, I hope all is well, I’ll get straight to the point. I want to purchase some of Papa Gee’s Soaps, how can I go about doing that ? Take care and God Bless. Looking forward to hearing back. I don’t sell Papa Gee’s products myself — I just buy them 🙂 Here’s Papa Gee’s Etsy shop.